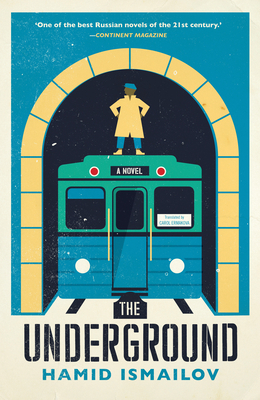 Named one of “the best Russian novels of the 21st Century,” The Underground is the unforgettable story of an abandoned mixed-race boy navigating the wondrous and terrifying city of Moscow before the Soviet Union’s collapse. “I am Moscow’s underground son, the result of one too many nights on the town.” So begins the story of Mbobo, the precocious 12-year-old narrator of this captivating novel by exiled Uzbek author and BBC journalist Hamid Ismailov. Born to a Siberian woman and an African athlete who came to compete in the 1980 Moscow Olympics, Mbobo must navigate the complexities of being a fatherless, mixed-raced boy in the shaky terrain of the Soviet Union before its collapse. With echoes of Ralph Ellison’s Invisible Man and Fyodor Dostoevsky’s Notes from Underground, Ismailov’s novel tackles head-on the problems of race and the relationship between the individual and society in a thoroughly modern context. While paying homage to great Russian authors of the past—Dostoevsky, Turgenev, Gorky, Nabokov, and Pushkin—Ismailov emerges as a master of a new kind of Russian writing that revels in the sordid reality and diversity of the country today. Named one of “the best Russian novels of the 21st Century" (Continent Magazine), The Underground is a dizzying and moving tour of the Soviet capital, on the surface and beneath, before its colossal fall. Born in an ancient city in what is now Kyrgyzstan, Hamid Ismailov is an Uzbek novelist and poet who was forced to leave his home in Tashkent when his writing brought him to the attention of government officials. Under threat of arrest, he moved to London and joined the BBC World Service, where he is now Head of the Central Asian Service. In addition to journalism, Ismailov is a prolific writer of poetry and prose, and his books have been published in Uzbek, Russian, French, German, Turkish, English and other languages. His work is still banned in Uzbekistan. He is the author of many novels, including Sobranie Utonchyonnyh, Le Vagabond Flamboyant, Two Lost to Life, The Railway, Hostage to Celestial Turks, Googling for Soul, The Underground, A Poet and Bin-Laden, and The Dead Lake; poetry collections including Sad (Garden) and Pustynya (Desert); and books of visual poetry including Post Faustum and Kniga Otsutstvi. He has translated Russian and Western classics into Uzbek, and Uzbek and Persian classics into Russian and several Western languages. "Ismailov’s works blend a keen awareness of the cosmopolitanism of the Soviet project, with its feverish drive for modernization.… It also pays homage to the rich tapestry of Russian—and Soviet—literature, and the interplay between the two.The Underground’s structure is reminiscent of Yerofeyev’s Moscow to the End of the Line; and Ismailov delights in pan-Soviet literary references, from Abkhazia’s Fazil Iskander and Chuvashia’s Gennady Aygi to Odessa’s ‘Ilf and Petrov’ and Nobel laureate Ivan Bunin. Ismailov sees himself as part of the Russian literary tradition (his prose has been compared to Bulgakov, Gogol, and Platonov).… Ismailov's novel is a deep examination of the confusions of Soviet and post-Soviet ‘Russianness. '… An intricate portrait of an all too foreign loss: the disappearance of one’s country."